In a medium bowl, whisk together all the ingredients. Pour into ice pop molds, insert a popsicle stick into the center of each, and freeze for 4 to 5 hours or overnight. My daughter will be thrilled with these, and I know she will love to be in charge of making them. Great! I used to make these for my kids. I used frozen orange juice concentrate and yogurt. yum! Did you dilute it or just thaw it used it straight from the can? I used it straight from the can. I do think a little maple syrup and vanilla would be a nice addition! How much OJ concentrate and yogurt did you use? I’d love to try it without maple syrup as well. These look delicious! Was wondering if these would work in those yogurt tubes you use also? And is Greek yogurt Ok? And one more question lol how long can you freeze these for? Also I love your cookbook and your website. So many recipes are now staples in my house cinnamon bread and granola to name a few!! I was wondering can you make these without the maple syrup? HI Sandy. You could but it would lack a little sweetness. You might try using a little concentrated orange juice to replace the maple syrup. Honey is an option, too. These look so refreshing! I think they’d be nice with some orange slice pieces in them too! (plus it would up the fiber!) :) Thanks for sharing! Was wondering if this would work with other fruit/ fruit puree? My two year old loved them & loved helping me mix! Definitely trying this soon … thanks for the instructions! Yep, fresh squeezed would work, too. I’ve made them with pureed oranges, too, so as to not lose the fiber benefits of the whole fruit. They were delish. Could you freeze this in one large container and scoop it out like ice cream from the carton? Hi Alex. We haven’t tried that, but I imagine you could. I just made these with Greek Yogurt, and found that I needed to add additional honey and OJ to compensate for the tartness. But they do taste yummy! Thanks for the recipe! You had me at “orange cream” – my favorite! I’m wondering if I could sweeten with agave nectar rather than the maple syrup? Would I use the same amount? Anyone know? You may want to stay away from Agave…..just read the other day that Agave is worse than corn syrup…….I don’t even buy corn syrup anymore and haven’t in years…..I sweeten most everything with honey……I love maple syrup too, and I do use it for some things, I put it in my plain yogurt….and I will use it in these creamsicle pops too. Orange Creamsicle is my favorite flavor — I will try these soon! Where did you get the cute molds shown in the photo? I printed out the recipe and didn’t even notice that link! Thanks! These pops look and sound wonderful…..could someone tell me the best brand of pop molds to buy ? I checked them out on Amazon, but still confused….would like to buy something that I know others have used and like…..hope to hear from someone on here before I buy any….these days you have to be careful about plastic !!! Thank you, Susan, this review does help! I love all the shape choices. Jannell was kind enough to remind us that we can also use Dixie cups, so that’s helpful too! 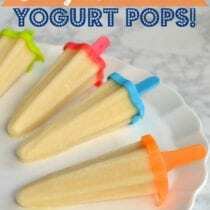 You can also make them in Dixie cups with popsicle sticks. I would think they would be good without any sweetner,i’m diabetic so,I might try them without any sugar,i make a plain berry parfait with just blueberries and strawberries in plain yogurt and I like it. 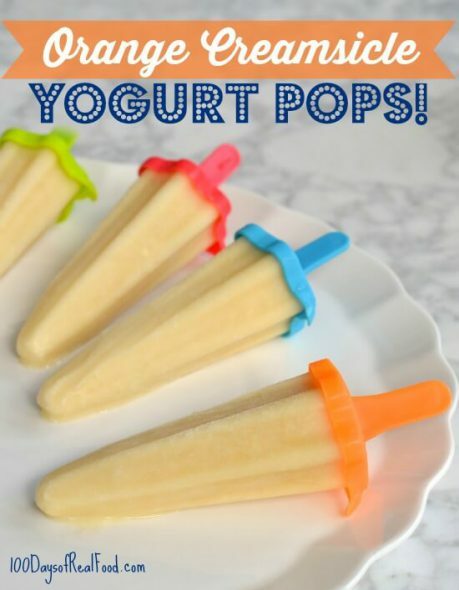 Made these last night with thick Greek yogurt – and then my three-year-old loved having a popsicle for breakfast! She loved it even more that I had one with her, though when she told nana and granddad that she had a popsicle for breakfast, they were not too impressed – I had to put them straight on the ingredients list! Adding these to the repertoire for sure. YES! Bathroom size dixie cups plus popsicle sticks work well. Also, put the stick thru a cupcake liner to catch the drips with little kids. Hi Brad. We typically do not use flavored yogurts but I’m sure it will work fine. My baby is loved it. These were a great idea! I made a few changes for ours, but the concept was something I hadn’t considered, so I appreciated that. My girls will (thankfully!) eat unsweetened yogurt, so I didn’t add any syrup. Also, the pulp of oranges has so many nutrients, so I just peeled two oranges and tossed them in the blender. We never have juice in the house, anyway. It was a huge hit!!! Great to know your kiddos liked them without the added sugar! Sadly, fresh oranges are out of season right now. We avoid juice as well in favor of whole fruits. May have to cheat and use OJ for now. At least it is less juice then straight juice Popsicles. Are you using fresh squeezed orange juice or something else? Does it matter for this recipe? Thanks! Hi Katie. Fresh squeezed is great but it doesn’t have to be fresh squeezed. I have 4 of the Silicone Ice Pop Moulds.. and half of this recipe filled them perfectly. I can’t wait to see how they turn out! The mixture smelled just like the store-bought creamsicles, and tasted better than the store-bought! My son hugged me when he saw that I was making him dye-free goodies! Can you use this in the unfrozen form as “flavored” yogurt? My husband and kids love the orange flavored yogurt from the store, and I’m trying to find more real-food alternatives to flavor plain yogurt. How long would it keep in the unfrozen form? Hi Nikki. Sure, that should work. This will help with fridge shelf life: http://stilltasty.com/fooditems/index/18717. My kids. 4 and 1 1/2, love these and so do I. I was impressed that they actually taste like the creamsicle pops I bought from the ice cream truck as a kid. The popsicles were simple to make and I had all of the ingredients on hand. I love being able to give my kids popsicles for dessert or when we are playing outside and not feeling guilty about them eating junk. I plan to make these for our 4th of July party for all the kids….and adults! Oh my word, are these good! Thanks so much for the recipe! Could you freeze these in the Norpro silicone ice pop makers? I know that you put your smoothies in those for your girls’ lunches (I bought some after reading a post). Just wondering if it would work the same. Yes, the silicone will work, too. These were sooooo easy to make and my family loved them! Just noticed the maple syrup and wondering what 100days team thinks about it as a sugar substitute ? In what way is it better than sugar ? Are there any other natural sweeteners you recommend for muffins and yoghurt etc ? Hi there. This post will help: http://www.100daysofrealfood.com/2011/05/06/mini-pledge-week-9-no-refined-sweeteners/. If you do a little research you will find lots of health benefits in pure Maple Syrup! Also if you’re wondering the difference between organic and non organic maple syrup, it’s whether or not they clean their sap collecting equipment with an organic certified cleaner- as chemicals are never used on the trees or syrup itself. I saved this recipe for Memorial Day, which marks a period of hot, muggy weather for us in Texas. Tested the liquid, and nearly swooned,it was creamsicle come to life – but I did lose a bit of flavor after freezing. Not bad,just much more mellow, with a hint of orange in the cream. I think I will try the orange juice concentrate and a bit more honey next time to see if it keeps a stronger flavor. Great base recipe to play with!! Could this be frozen in a covered container instead of Pops? Actually, it can’t. It froze so hard in the container, I couldn’t dip it out at all. Had to “shave” it out and couldn’t get much at a time. Could be the orange juice? Need to find a way for it to be more creamy and soft. How much coconut cream? Do you use less of any other ingredient when adding the coconut cream? I used to get on rare occasions but MUCH healthier. I think it could also be a good breakfast protein drink in the liquid state.